In his book, Man’s Search for Meaning (2006), Viktor Frankl quotes the Austrian poet Rainer Maria Rilke, who says “Wie viel ist aufzuleiden.” This statement roughly translates to mean, “How much suffering there is to get through.” Rilke and Frankl envisioned getting through the inevitable suffering of life as others might talk about getting through work. There is no doubt that life is full of pain, sorrow, loss, brokenness, tragedy, and malevolence. We are resilient creatures. We can handle earthquakes, cancer, and death. That which shakes us to our core the most quickly and the most significantly is betrayal and deception, and its quiet cousin, self-deception. If we remain unaware of our thought processes and how they influence our lives and ability to function, we deceive ourselves. 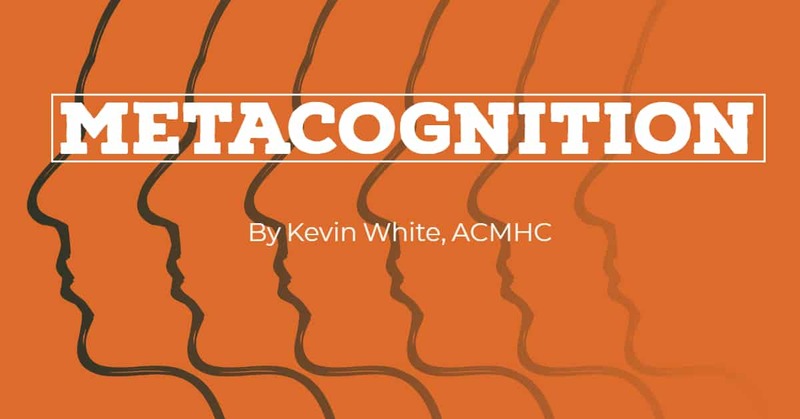 As those in the mental health field continue in the wake of modern evidence-based treatments such as Cognitive Behavior Therapy (CBT), we hear terms like cognitive distortions and automatic thoughts often. The tendency can be to narrow our focus to the content of thoughts, to what we think; or, to make attempts to understand why we think the way we do. We ask ourselves what it is we are thinking, then we embark on a journey to identify the beliefs undergirding those thoughts. While it is useful to explore the content of thoughts and the beliefs behind them, it does not follow that all emotional disturbance and neuroses are based in the what and why. Perhaps the missing component lies somewhere in the how, or the conscious strategies we use to interpret our thinking. The term metacognition was originally coined by John Flavell in 1976, as he trudged through the deluge of complex, incomplete theories of intellectual development and learning. Simply put, metacognition refers to our thinking about our thinking. Departing from some of the limitations of prevailing perspectives such as those put forth in Piagetian theory, Flavell continued to formulate his metacognitive theory throughout the 1980’s. Metacognition refers not only to cognitive processes, but to awareness and control of thinking (Nelson & Narens, 1990). Our thoughts about what we think are used to monitor, control, and appraise the products and process of awareness. But, what is the importance of this obscure psychological concept? Metacognitive Therapy, a second wave CBT, proposes that people become trapped in their emotional disturbance because their metacognitions cause patterns of responding to internal experiences, which tend to maintain difficult emotions and strengthen negative ideas. Patterns such as worry, rumination, fixed attention, and maladaptive strategies for self-regulation and coping keep us stuck in our distress (Wells, 2009). Therefore, it is not merely the content of our thoughts that cause and exacerbate distress, but the style with which we choose to approach and deal with those thoughts. These cognitive processes are what make emotions self-perpetuating. Isolated emotional responses in the brain last a mere 20 to 30 seconds. In the body, the sensation of emotion lasts approximately 1 to 2 minutes (Harrison, et al., 2011). How we think then begins to perpetuate the emotion. Imagine a man with social anxiety disorder and a history of panic episodes. Imagine that he is spending a day with a few close friends. The group boards a train and settles in to the comfortable seats. Suddenly, everyone aboard the train experiences the exact same physical sensation. The entire train jolts at once, as it slowly begins its journey. For many of the people on the train, the sudden sensation produces a small increase in anxiety-like symptoms. Their heart rates increase, their breathing changes, perhaps their palms become sweat-laden. And, for those people, the sensation begins to reside almost immediately. For the man with social anxiety, the same sensation is interpreted differently. He is reminded of his previous experiences in groups of strangers or aboard public transportation. His thoughts become self-focused, and his attention is turned inward. His cognitive processes cause the perpetuation of the initial anxiety. From there, he might begin to fear that others on the train are privately criticizing him, or that he will likely do or say something foolish to ruin the entire day for his close friends. He thinks, “Everyone will notice how anxious I am. My anxiety will annoy them, and they will think I’m an idiot. I’ll never be able to show my face in this group of friends again.” The inclination to worry or ruminate, shift attention to perceived threats, and cope by avoiding thoughts interferes with normal adaptive processes and leads to sustained thinking about danger, thus causing symptoms to persist. One of the primary elements of metacognition is the recognition of limitations to one’s own knowledge or ability. Recognition of our limitations affords us the opportunity to plan how we might go about expanding our knowledge base or extend our limited abilities. The process of expanding our knowledge and abilities is part of the work that Frankl and Rilke spoke of. By forming an accurate conceptualization of our current state, and then recognizing what we would like to achieve or be at a point in the future, we create fertile ground for growth. Kevin White is an Associate Clinical Mental Health Counselor at Brighton Recovery Center. For more advise from experts like Kevin, visit our addiction recovery blog or YouTube channel. emotional feelings in the brain. Journal of Neuroscience, 30 (38), pp. 12878 – 12884. Nelson, T.O & Narens, L. (1990). Metamemory: a theoretical framework and new findings. In G.
theory, Vol 26. New York: Academic Press. Wells, A. (2009). Metacognitive therapy for anxiety and depression. New York: The Guilford Press.